I can eat this every day with a piece of salmon and be perfectly content! 2007 Family Circle. In medium-size bowl, whisk together vinegar, lemon juice, honey, salt and pepper. Gradually drizzle in olive oil while whisking until thick and well blended. Drizzle dressing over top of salad; toss to evenly coat ingredients. If desired sprinkle with extra cheese. I love salads. Blue cheese is one of my favorites. This recipe sounds so good. I wish I could have one for lunch. Big 5 girl. 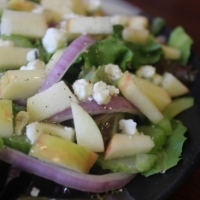 I agree - I love fruit and blue cheese on my spinach salad...the combo just can't be beat, and I never tire of it. I must try your dressing - sounds wonderful, and I can never have too many homemade dressings for my spinach salads!! This reminds me of my childhood -- we always had Red Delicious apples in the house and blue cheese often as my Dad loves it. But I love it too, especially with apples. Gets my high 5 and I'll be having it soon! 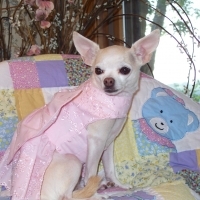 Like chihuahua's recipes? Never miss an upload!